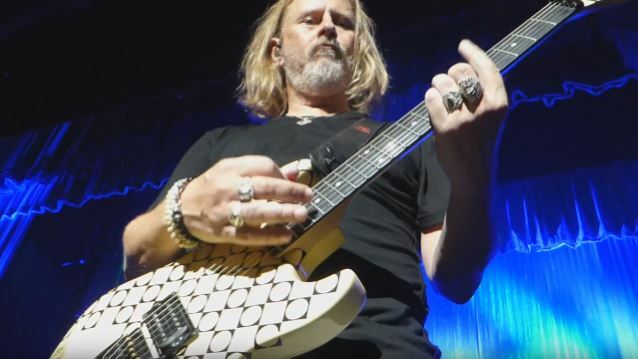 Fan-filmed video footage of ALICE IN CHAINS' entire September 27 performance at Majestic Theatre in San Antonio, Texas can be seen below. ALICE IN CHAINS, who opened the first five shows on GUNS N' ROSES' summer North American stadium tour, is now on a headlining trek that brings the group to Scottsdale, Arizona on Friday (September 30). ALICE IN CHAINS singer William DuVall told the WRIF radio station in June that it was "too early" to talk about the band's new music, despite the fact that it's been more than three years since the release of their last studio album. "The Devil Put Dinosaurs Here" sold 62,000 copies in its first week of release.